Qoovee launches a unique promotion system on the business platform of Qoovee.com based on the PAYMENT FOR RESULT system. There are inquiries from customers – you pay. There are no inquiries – any way you promote for free. On the business platform of Qoovee.com, you promote your business while not paying for subscription, impressions or clicks. You pay only after you get an inquiry from your potential clients, for requests of your contact details, and at the same time, you set the rate for how much to pay for the clients’ inquiries. For example, you set a price as 2$ per an inquiry, then top up your balance for 100$ and start promoting. As a result of the promotion, one client sends you an inquiry, another text you a message in the chat or opens your contact details – in these cases, the amount on your balance will be deducted by 2$ per inquiry. If a customer visits your store, review your products and services, but does not leave a request or message, then you do not pay anything. Money is on your balance and will be spent from there only in case you get requests from potential customers. 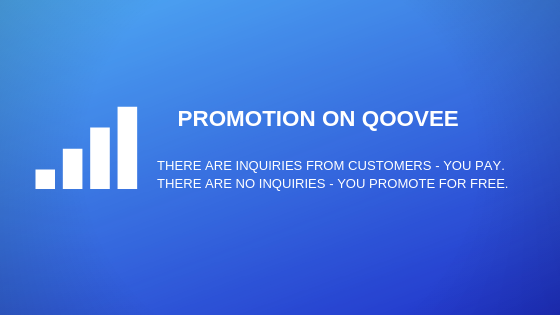 Your products and services will start to be promoted in the catalog, in search results and other places on Qoovee with higher priority than of those companies, that did not recharge the balance for promotion or those who set the rate for customer’s inquiries below your rate. You get inquiries, requests from potential buyers and fees are charged off from your balance only upon receipt of inquiries and requests. 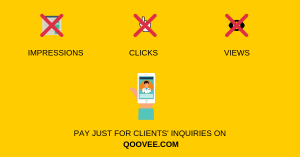 Start your promotion on Qoovee today – pay only for the result!